​"Generation Unexpected and Jewish Life in Contemporary Poland"
a Canadian-born Jew in Poland. 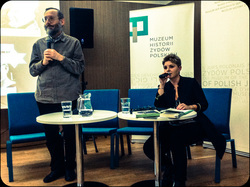 The two theatre makers will draw from their unique personal stories to talk about Jewish life and culture in today’s Poland, and their professional and personal involvement in building the Polish Jewish community. ​Over the past few decades, Poland has become a hotbed of contemporary Jewish identity debate—in Europe, but perhaps even more so in North America and in Israel, where we fnd so many descendants of Polish Jews. "The Meshugene Effect" is a research-creation project situated in a socio- cultural milieu, which has been receiving much attention in academic and popular circles. 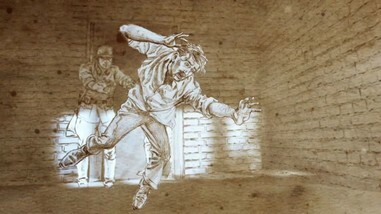 Co-created by Michael Rubenfeld and Sarah Garton Stanley, the show features Rubenfeld, Mary Berchard and Katka Reszke. We Keep Coming Back tells the true story of a trip to Poland that Michael took along with his mother. 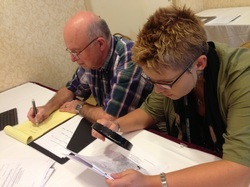 Both descendants of Polish Holocaust survivors, the mother and son reconnect with their past and each other. The quest, however, takes an unexpected turn when they discover a vibrant contemporary world of Jewish life in Poland. We Keep Coming Back is performed by Winnipeg's Mary Berchard and Michael Rubenfeld, who are real-life mother and son, alongside Katka Reszke, author of 'Return of the Jew'. It is presented in a media rich environment, incorporating video footage from the team's research trips, archival material (photographs, maps) and live and recorded music. "We Keep Coming Back is an thought-provoking, timely new work. I am excited to have it come to Winnipeg and play an integral part of WJT's 30th anniversary," says Ari Weinberg, WJT's Artistic Director. ​A panel of experts moderated by Poland’s Honorary Consul General Marek Lesniewski-Laas will discuss the revived interest in the history of Jews in Poland and the resurgence of Jewish culture in Poland today. Panelists include: Amy and Josh Degen, American facilitators for the advanced completion of the Bialystok Cemetery Restoration, a project focusing on the preservation of Jewish history in Bialystok and restoration of neglected Jewish cemeteries in the area; Leora Tec, founder and director of Bridge To Poland, an organization committed to breaking down stereotypes through trips that highlight how non-Jewish Poles are commemorating Jewish life in Poland today; Katka Reszke, author of Return of the Jew: Identity Narratives of the Third Post-Holocaust Generation of Jews in Poland, filmmaker, and photographer working in the US and Poland. ​A mother and son, both descendants of Polish Holocaust survivors, decide to return to Poland in the hopes of finding their lost identity and a way to reconnect with each other. The plot takes an unexpected turn when Michael and Mary discover a vibrant contemporary world of Jewish life in Poland. Their journey will reveal a parallel narrative among Poles seeking a reconnection with lost Jewish identities. A new story unravels. ​July 1, 2017, 2PM - JCC KRAKÓW, 24 Miodowa St. It is an interesting time to be a feminist. Some had considered the work of feminism to be over, but inequality is still ever-present in societies, religious and political, around the world. 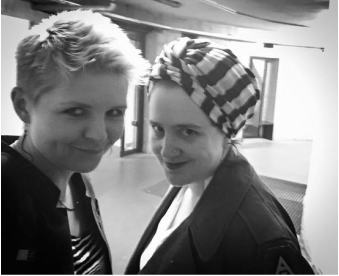 Writer/filmmaker Katka Reszke and artist/educator Jacqueline Nicholls will discuss the ways in which women are weaving their identities, finding their fighting spirit, and exploring what it means to have non-patriarchal leadership. ​A mother and son, both descendants of Polish Holocaust survivors, decide to return to Poland in the hopes of finding their lost identity, and using their quest as a way to reconnect with each other. The plot, however, takes an unexpected turn when Michael and Mary discover a vibrant contemporary world of Jewish life in Poland. Unbeknownst to them, their journey will reveal a parallel narrative among Poles seeking a reconnection with lost Jewish identities. A new and unexpected story is born. We Keep Coming Back is performed by real-life mother and son, Mary Berchard and Michael Rubenfeld, as well as Katka Reszke, author of “Return of the Jew”. It is presented in a media rich environment, incorporating video footage, archival material, and music. Overview: Katka Reszke tries to make sense of the personal narratives of several Polish women (including her own), who embarked on a pursuit of Jewish identity following a feeling, an intuition, an uncanny precognition about their Jewish descent. These self-narratives reveal different ways of making sense of extraordinary experiences of memory and transition set against the landscape of troubled Polish-Jewish history and a new curious Polish-Jewish present. 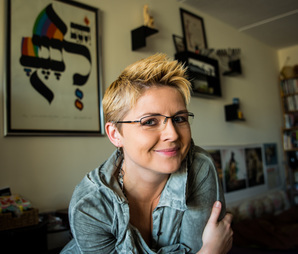 Katka Reszke is a Polish-born, U.S.-based writer, documentary filmmaker, photographer and researcher in Jewish history, culture, and identity. Currently affiliated with Brandeis University, Katka holds a Doctorate in Jewish Education from the Hebrew University of Jerusalem. She is the author of "Return Of The Jew: Identity Narratives of the Third Post-Holocaust Generation of Jews in Poland" (2013) and the screenwriter of the acclaimed documentary film "Karski & The Lords of Humanity" (2015). 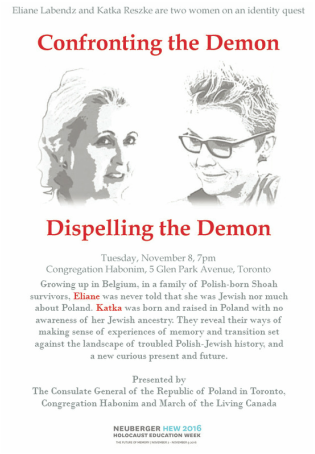 As a writer and filmmaker, Katka specializes in Polish-Jewish history and relations, as well as human rights, social justice, minority and gender issues. Katka Reszke lectures on different aspects of the Polish-Jewish experience at educational and cultural institutions in North America, Europe and Israel. Recipient of fellowships from the Memorial Foundation of Jewish Culture and the Mandel Foundation, Katka is a member of the ROI Community – A Schusterman Initiative, and a contributor to the core exhibition of POLIN – The Museum of the History of Polish Jews. 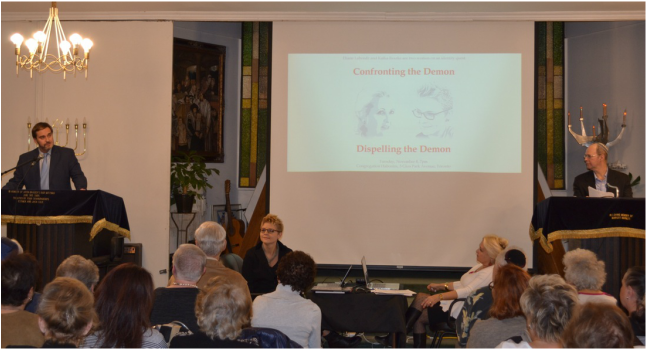 "The Meshugene Effect" – a book and an experimental documentary featuring personal narratives of several Polish women, who embark on a pursuit of Jewish identity following an irrational feeling, a hunch about having Jewish ancestry. The project explores cultural and discursive contingencies surrounding religion, gender and authenticity and how they affect the way we make sense of experiences of memory and transition. All of this set against the landscape of troubled Polish-Jewish history and a new curious Polish-Jewish present. ​Drawing from her research and personal experience, Katka Reszke discusses the unique cultural and historical circumstances, in which an 'unexpected generation' of Jews began to emerge in Poland following the collapse of communism. Once home to the greatest Jewish community in the world and then site of the biggest tragedy in Jewish history, today Poland is experiencing what some have called a “renaissance of Jewish culture.” Simultaneously, more and more Poles are discovering or newly embracing their Jewish roots. Can there be “authentic” Jewish life in Poland after decades of oppression? 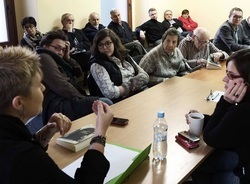 Drawing from her research and personal experience, Katka Reszke discusses the unique cultural and historical circumstances, in which an 'unexpected generation' of Jews began to emerge in Poland following the collapse of communism. Once home to the greatest Jewish community in the world and then site of the biggest tragedy in Jewish history, today Poland is experiencing what some have called a “renaissance of Jewish culture.” Simultaneously, more and more Poles are discovering or newly embracing their Jewish roots. Can there be “authentic” Jewish life in Poland after decades of oppression? "Generation Unexpected: Discovering Jewish roots and the resurgence of Jewish life in contemporary Poland"
Jewish culture.” Simultaneously, more and more Poles are discovering or newly embracing their Jewish roots. Can there be “authentic” Jewish life in Poland after decades of oppression? Since the fall of communism, thousands of people in Poland have discovered Jewish roots. Among them is a peculiar category of those, whose discovery was preceded by a ‘hunch’ – an irrational conviction that they were Jewish before they actually knew they were Jewish. Their self-narratives reveal different ways of making sense of extraordinary experiences of memory and of transition set against the landscape of troubled Polish-Jewish history and a new curious Polish-Jewish present. We Keep Coming Back tells the true story of a trip to Poland that theatre artist Michael Rubenfeld took along with his mother Mary Berchard, director Sarah Garton Stanley, and Polish author/filmmaker, Katka Reszke. It was a trip of return to the country of Michael and Mary's Polish origins that they embarked on to better understand Poland's complicated history, and in turn, their own. The journey, however, took an unexpected and remarkable turn when Michael and Mary discovered a vibrant contemporary world of Jewish life re-emerging in Poland. On March 5th, Michael, Sarah, Katka and the Polish Consul General Grzegorz Morawski, invite you to a special presentation about the project. The evening will include a video presentation highlighting the first journey to Poland, and excerpts of the show-in-progress, as well as a conversation about the resurgence of contemporary Jewish life in Poland. This event is a fundraiser to support the premiere of We Keep Coming Back at the Jewish Culture Festival in Krakow in June/July 2016. A buffet dinner and drinks will be served. "Karski & The Lords of Humanity"
"Karski & The Lords of Humanity" at Cinema Village, NYC. ​Q&A with Slawomir Grünberg on November 27, 28 & 29. ​"Karski & The Lords of Humanity" at JCC Manhattan. ​Q&A with Slawomir Grünberg & E. Thomas Wood moderated by Annette Insdorf will conclude the showing. U.S. Pre-Premiere of "Karski & The Lords of Humanity"
Director of the Jan Karski Institute for Holocaust Education, Dr. Robert Lieber, Professor, Edmund A. ​ Jabłoński and Screenwriter Katka Reszke. Visual artist Jacqueline Nicholls and writer-filmmaker Katka Reszke discuss the role of art in different ways of being Jewish in today’s world. Polish Premiere of "Karski & The Lords of Humanity"
"Coming Out Polish Style" offers a rare look into LGBTQ life in contemporary Poland. 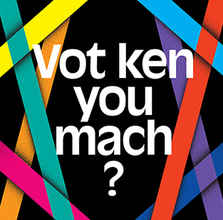 The film explores the issue of sexual minorities' rights in a conservative society, which is undergoing a very dynamic transformation, allowing for more and more successful liberal changes. The documentary focuses on the diverse and complex identity struggles involved in the process of 'coming out'. It profiles both celebrities who are openly gay in Poland, as well as young people from small towns who are still in the process of 'coming out'. How can a culture flourish when its members are less than 1% of a population? This fall, the Museum of the History of Polish Jews unveils its core exhibition against a backdrop of nearly 20 Jewish festivals in Poland, and the proliferation of Jewish-themed art, Jewish Studies departments, bookstores, and Jewish-style restaurants. Yet Poland’s Jewish population is only 25,000. How do we interpret this phenomenon? Scholars Konstanty Gebert(European Council on Foreign Relations), Geneviève Zubrzycki(University of Michigan), and Samuel Kassow, moderator (Trinity College), and artists Katka Reszke (writer and filmmaker) and Piotr Paziński (novelist) discuss the needs of the Polish Jewish community, the reasons for Poles’ increasing interest in Jewish culture, and the complicated use of the word “revival” in connection to Jewish life in Poland today. For those interested, there will be a discussion following this program in the Great Hall. Presented by YIVO, the Polish Cultural Institute, and Tablet Magazine. The long-awaited film Karski and the Lords of Humanity by Emmy-winning documentary filmmaker and Guggenheim Fellow Slawomir Grunberg is a feature-length, partially animated documentary about the man who tried to prevent the Holocaust. After the screening director Slawomir Grunberg will sit down with the screenwriter Katka Reszke and Jan Karski's biographer E. Thomas Wood to discuss the film and for a Q&A with the audience. ﻿On 28 October 2014, the permanent collection of the Museum of the History of Polish Jews in Warsaw was opened. The Jewish Museum Berlin and the Polish Institute Berlin are celebrating this event with a panel discussion on contemporary Jewish life in Poland with Dr. Dariusz Stola, director of the Warsaw Museum, writer and author Katka Reszke, and musician Raphael Roginski. The Shofar Trio will play "Nigune" – magical Jewish liturgical songs – and cheerful dance tunes. Spotkanie autorskie ze Sławomirem Grünbergiem i Katką Reszke połączone z prezentacją niepokazywanych do tej pory fragmentów filmu „Karski i władcy ludzkości”. Cape Town Holocaust Centre > Events > 15th Anniversary screening: "Shimon's Returns"
Workshop and UK film premiere of "Shimon's Returns"
Panel discussion following the screening of "Aftermath" ("Pokłosie") directed by Władysław Pasikowski. With Katka Reszke and Slawomir Grunberg. 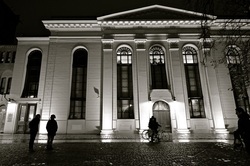 Presentation on "Return of the Jew" at the Wroclaw Synagogue. Followed by an open discussion with the author, Katka Reszke. Katka Reszke in a presentation and discussion led by Stanislaw Krajewski. On "Return of the Jew" and the Polish-Jewish experience between the 1960s and present day Poland. The event is presented in partnership with YIVO Institute for Jewish Research. “Return of the Jew” – about identity, “rebirth” of Jewish life in Poland and difficult coming-outs – Bartek Lis in conversation with Katka Reszke, author of the book “Return of the Jew”. Join us in celebrating Katka Reszke’s book Return of the Jew: Identity Narratives of the Third Post-Holocaust Generation of Jews in Poland, published by Academic Studies Press. Author’s presentation and Q&A session will be followed by a modest reception. 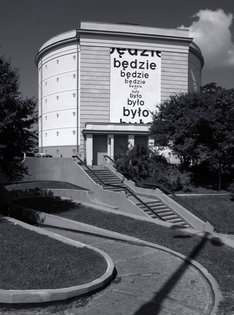 The event is presented by YIVO in partnership with the Museum of the History of Polish Jews. 2 PM: Q&A session with Katka Reszke (Poland), author of “Return of the Jew: Identity Narratives of the Third Post-Holocaust Generation of Jews in Poland” moderated by Edyta Gawron, Ph.D.
Katka Reszke will be signing books in English and in Polish at both events. Premiere screening of documentary film “Magda” (9min.) directed by Slawomir Grünberg & Katka Reszke and a special screening of “Castaways” (“Wyrzutki”) (17min.) directed by Slawomir Grünberg & Tomasz Wiśniewski, edited by Katka Reszke. Q&A session with the filmmakers. Both films are in Polish with English subtitles.